On the Nintendo Wii and the Sony PlayStation 2, Konami’s MLB Power Pros series is one of the best and deepest baseball video games to come to home consoles in a long time. Despite the decidedly unique graphics and especially the player models, the games feature both a remarkably detailed, almost RPG-like career mode, and a general manager mode with tons of options for those who love to micro-manage. So it was with great anticipation that this reviewer first loaded up MLB Power Pros 2008 for the Nintendo DS, and with great disappointment that he would later turn it off. Let’s get the good stuff out of the way first. The core on-the-field gameplay is quite solid. 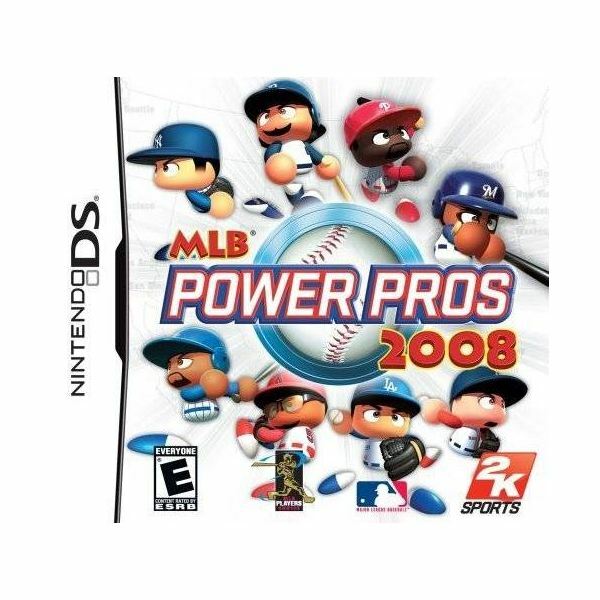 As in MLB Power Pros 2008‘s console big-brothers, the handheld version allows players to choose difficulty controls, as well as whether or not to manually control every facet of the game (pitching, hitting, running, fielding, etc.). This is a nice feature that allows user control over whether or not they want to be involved in all aspects of the game, or just casually hit and pitch. By the way, both pitching and hitting are controlled similarly. When you’re on the hill, you use the directional pad to pick a pitch, then hit the B-button to throw it, and finally use the D-pad again to select the location while the toss is on its way to the plate. During an at-bat, the D-pad is used to select bat angle, A is to bunt and B is to swing away. It works acceptably, but it is much harder to be pinpoint accurate as a hurler without the luxury of an analog stick. Meanwhile, the game looks every bit as good as its console counterparts. Of course, the Wii and PS2 versions weren’t exactly graphical masterpieces, but they were crisp, clean, cute and effective. The same is true with the Nintendo DS edition. The music is very similar, too, and the tunes are best described as upbeat and bouncy. They must be extremely high quality as well, as they sound great even through the subpar built-in DS speaker, let alone through headphones. A public address announcer is included, and while it is kind of cool to hear player announcements before every at-bat and pitching change, the quality is rather spotty and it makes one wonder if the space needed to store this data in the DS card couldn’t have been used in a slightly better way — like adding some much needed depth to the game. You know that cool, strategy heavy franchise mode I mentioned was in the console versions of MLB Power Pros 2008? It’s not here. What about that career mode that essentially allowed you to live the life of a professional baseball player? It’s missing in action. In fact, there’s no season mode and no online multiplayer either. Instead, Power Pros DS sports just four main modes of play: a quick play mode and an 8-team playoff mode, both of which are fairly self-explanatory, as well as a team edit feature and something called Home Run Challenge. Team Edit allows you to pick your favorite team and alter the roster as your heart desires. The beauty of this is that you can, say update the woefully behind-the-times rosters or pick your favorite MLB franchise and turn them into a dream team of the best players in the game. Home Run Challenge, on the other hand, is a lot like the real life Home Run Derby. In this mode, you choose one player and hit as many home runs as possible in 10 pitches. It’s fairly easy, but it was enjoyable nonetheless. The game is fun, but at the end of the day, you just can’t shake the feeling that there should have been more content here, especially given the depth of Power Pros on the Wii and PS2. It was a close call, but ultimately I have to give MLB Power Pros 2008 for the Nintendo DS a thumb’s up, but only because it is the best baseball game available for the DS in a rather sparse market. The game is fun, but it is still immensely disheartening that so much of the depth that made the console Power Pros games special wound up on the cutting-room floor. If you’re seriously itching for a baseball fix for the dual-screen handheld, this is definitely the way to go. Everyone else should at least rent first, or possibly even save their hard-earned money and hope that Power Pros 2009 adds some of the features whose absence keeps this hardball sim from being something truly special.